This Wednesday I will be giving a 10 minute slide show for LucidNYC on the recent NYSAT projects followed by a 5 minute Q&A. 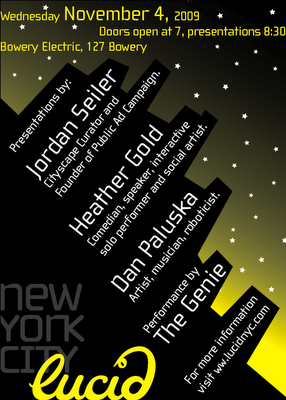 Their monthly event showcases interesting people and ideas in NYC and is well worth checking out. If you would like to come, please visit their website to purchase tickets in advance to save yourself 5 bucks. Doors open at 7:00pm and the talks begin at 8:30pm. See you there!